Hundreds of thousands of people fill Manhattan for the People’s Climate March. 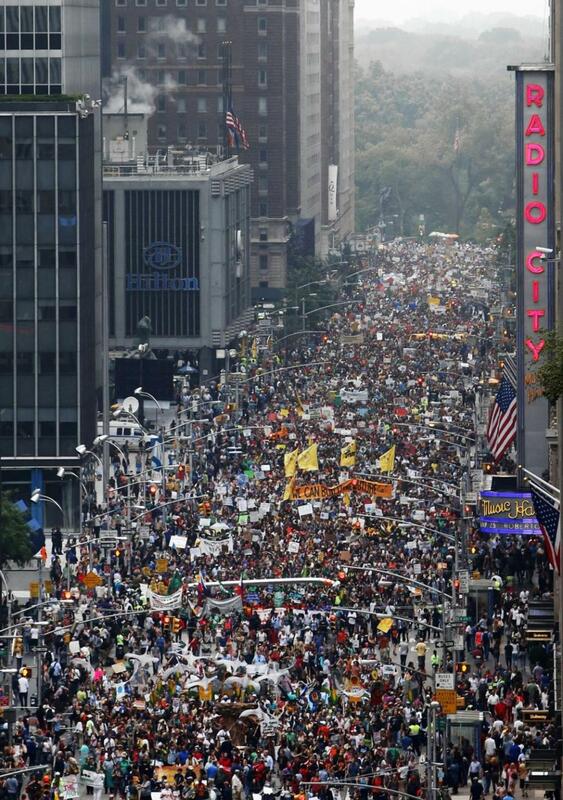 Here in New York City, more than 300,000 people participated in the People’s Climate March on Sunday. Marchers ranged from environmental justice activists to union members to college students to former Vice President Al Gore, United Nations General Secretary Ban Ki-moon, and several New York City politicians, including over a dozen members of the City Council and Mayor Bill de Blasio. Similar marches around the world attracted thousands more concerned with the toll human-produced greenhouse gases have on climate (a toll underscored by the Global Science Project’s report that global greenhouse gas emissions reached record levels in 2013). So what’s next? Though the negotiations on replacing the Kyoto Accord will begin in earnest in Paris next year, the next two weeks see three developments that comprise crucial progress in developing an effective response to climate change. 1) Local Policy. It is no secret that a major barrier to global climate policy is inaction at the federal level here in the United States. The separation of powers between the administrative and legislative branches has prevented approving a treaty that threatens entrenched coal and oil interests regardless of which party controls the White House. Although some executive actions (such as regulating aging coal-fired power plants out of business) have produced positive changes, the federal government has not made comprehensive moves to reduce American dependence on fossil energy. Some change, however, is happening on the local level, with New York City at the forefront. Near the end of his administration, then-Mayor Michael Bloomberg served as Chair of the C40 Cities Climate Leadership Group, which describes itself as “a global network of large cities taking action to address climate change by developing and implementing policies and programs that generate measurable reductions in both greenhouse gas emissions and climate risks.” From implementing congestion taxes to bike-share programs, C40 cities have shared thousands of strategies to reduce local dependence on coal, petroleum, and natural gas over the past decade. This looks to continue. Ahead of participating in the People’s Climate March, current Mayor de Blasio announced that New York City will overhaul the energy-efficiency standards of all its public buildings and to pressure private landlords to make similar improvements. The initiative is part of a pledge, to be announced before the start of the United Nations Climate Summit on Tuesday, to decrease greenhouse gas emissions by 80 percent by 2050 from 2005 levels. The United Nations has pointed to that rate of decrease as a desired target for developed countries to mitigate the effects of climate change. Should the municipal government succeed in this initiative, it may be a model for its partners in C40, initiating changes at the local level that have eluded most national governments. 2) Divestment. To date, market incentives for reducing fossil fuels have failed due to lack of regulatory sanctions (again, a failure of national and global governance to regulate greenhouse gases). Divestment, a different economic model based upon shaming and punishing actors behaving in destructive practices has begun to take hold. The practice has its roots in the anti-apartheid movement of the 1970s and 1980s; demonstrations on college campuses (including one I participated in in 1985 at the University of California’s Berkeley campus) spurred educational institutions to divest from financial institutions tied to the South African government. The University of California subsequently moved to divest $3 billion; months later, Nelson Mandela was freed from prison. He subsequently visited the Bay Area in part to thank those who pushed for divestment. Thirty years later, the strategy of divestment from fossil fuels is spreading amongst college campuses and other institutional investors. This past May, Stanford University became the largest university to announce it was divesting from coal, and campus movements have pushed for similar actions at schools across the nation. This week, a new chapter in divestment begins as the Rockefeller Brothers Fund announces its $860 million philanthropic organization is set to join the divestment from fossil fuels. This action is particularly symbolic as the Rockefellers are heirs to John Rockefeller, the founder of Standard Oil. (Students in my classes may know Rockefeller and Standard Oil’s legacy in part from our discussions of what Cleveland-area refineries did to the Cuyahoga River throughout the twentieth century.) The divestment movement is working to convince large investors ranging from universities to pension funds to join; such actions may produce results where federal policies have thus far failed. 3) Design and Culture. The attraction of hundreds of thousands of diverse people to participate in the People’s Climate March indicates the broad cultural resonance of concerns around climate change. In addition to economic and policy moves, effective designs of buildings, systems, and a variety of goods modern people rely upon every day are crucial to the transition away from fossil fuels, especially if this transition is to be done without significant deprivation. There is no lack of prescriptive literature on sustainable design strategies, and the number of schools focusing on these issues is growing every year. In the days after the People’s Climate March, a gathering happens that has perhaps less dramatic presence in the news than the policy and divestment events described above, yet will have relevance to the goals of those actions. At the beginning of October, Pratt hosts the Partnership for Academic Leadership on Sustainability meeting, gathering representatives from several art and design schools to work on best implementing sustainability in what we teach to our students (including those enrolled in the Sustainability Studies minor I coordinate at Pratt). As the world pushes for a future away from dependence on fossil fuels, we work to train designers and architects who will help create that future. The march was an important show of concern. The political, economic, and organizational commitments in the days after the march will show the extent of how the symbolism results in progress. This entry was posted in events, history, sustainability on September 22, 2014 by Carl Zimring.